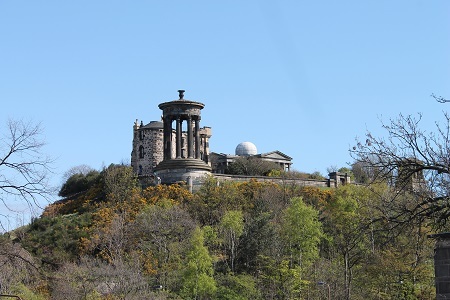 Perhaps the first view anyone ever has of Calton Hill is when they are on Princes Street, the main shopping thoroughfare of Edinburgh. This view is captured above and it provides the iconic image of the incomplete National Monument - often referred to as "Edinburgh's Folly". 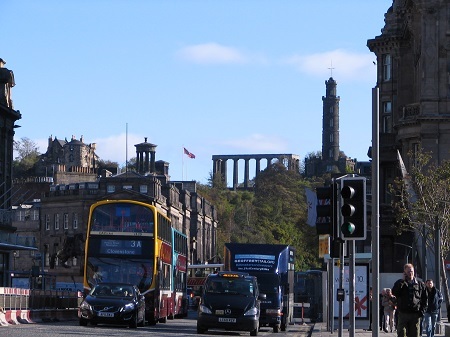 When the National Monument was envisaged in the early 19th century, the architecture of Edinburgh was following the Greek model and Edinburgh was referred to as "The Athens of the north". The National Monument was to be based on the Parthenon. However, funding ran out and today we see what has become an iconic image of Edinburgh. To the right of the National Monument in the above image is the Nelson Monument, built to celebrate the famous battle of Trafalgar. Today it houses exhibitions and the visitor can climb up to an outlook near the top for panoramic views of the city and its environs. The second view on this page is taken from within the Old Calton Hill Cemetery - which is also worth a visit. In this second view we see the City Observatory which at its height was one of the premier astronomical observatories in the world. You can navigate to the history of this fine observatory at the left of this page.